Toller Sketch bei Sketch Saturday wieder mal...da musste ich einfach mitmachen. Auf den weißen Flächen sind kleine blaue Schneeflocken gestempelt, meine Digicam mag die nicht so*ggg. Wonderful Sketch at Sketch Saturday again this week...I couldn't do anything else than working a little card for that challenge! On the whith papers I have stamped some little blue snowflakes but my digicam didn't like them too much*ggg. This is adorable. I love the little kids in your card. The colors are beautiful. 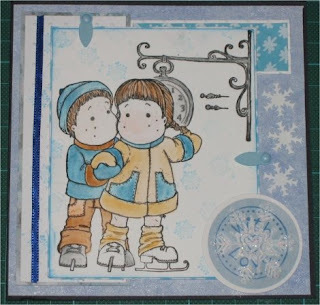 Gorgeous card, my fav Magnolia image - love the colours and snowflakes, great work. Lovely Card. Love the colours that image is so cute.